Seen from the other end of the Atlantic, the solution to the euro crisis always seemed obvious to some – not least New York Times columnist Paul Krugman. Yet the Nobel Prize-winning economist has been wrong on virtually everything he has said about European fiscal policy. This single sentence contains six key myths about austerity: that austerity is intrinsically wrong; that austerity policies were pursued most aggressively in Greece; that austerity has been bad for economic growth; that austerity is unpopular; that Greece is a victim of German austerity; and finally, that Europe should learn from the US and abandon austerity. To begin with, we need to define austerity. A typical definition includes measures taken by a government to reduce an excessive budget deficit, usually by either cutting expenditures or raising revenues. I prefer the more technical term “fiscal adjustment” – after all, the issue is not how much expenditures are cut or revenues increased, but to what degree the budget deficit evolves as a share of GDP. To provide a relevant case study, compare Greece, the worst economic disaster in the euro crisis, with Latvia. These two countries had the largest fiscal deficits, required the largest fiscal adjustments, and saw the largest output declines. Latvia’s fixed exchange rate to the euro and Greece’s adoption of the common currency in 2001 allow us to sidestep that complication. Nevertheless, monetary policy in the two countries differed greatly. Greece had access to ample liquidity from the European Central Bank (ECB), while Latvia did not, putting Greece at a major advantage in 2008-09. In cases such as these, those arguing against austerity are engaging in base populism, and assuming the existence of money where there is none. Incredibly, this is what Nobel Prize winner and New York Times columnist Paul Krugman has done throughout the European financial crisis. In a 2013 opinion piece, he noted that he had “argued that worries about the deficit are, in fact, grossly exaggerated.” Indeed he had: in 2008-10, when Latvia, Estonia, and Lithuania were hit by a liquidity freeze and reacted by carrying out successful fiscal consolidations, Krugman complained loudly about the terrible consequences of their austerity. Yet when they all three recorded high economic growth after two years, he refused to concede defeat. From 2008-13 no fewer than seven EU countries faced a lack of access to financing and had to turn to the IMF and the EU for emergency loans. Here too, Krugman has prescribed simply providing more money. What Krugman fails to explain is whence the necessary funding for large budget deficits should come. He discusses money as an infinite resource, not recognizing budgetary or financial constraints. In the case of Greece in particular, Krugman’s disregard for both the risk of sovereign default and the absence of funding is perplexing. Krugman also claimed that “the rush to austerity in Europe largely reflected the surge in sovereign debt spreads after Greece got in trouble; the bigger the spread, the harsher the austerity … But it turned out that the spreads didn’t reflect underlying fiscal fundamentals.” Yet at present, Greek 10-year bond yields hover around 10 percent, while former EU crisis countries such as Italy, Portugal, and Spain have bond yields below 2 percent. It looks like austerity does work, albeit sometimes slowly. Furthermore, austerity policies have not been attempted most aggressively in Greece: all three Baltic countries pursued more aggressive fiscal adjustments, especially Latvia. The Latvian government faced the global financial crisis head-on. When it arrived in late 2008, the World Bank calculated a baseline scenario in which Latvia would head to a budget deficit of 21.4 percent of 2010’s GDP, with public expenditures comprising 58 percent of GDP. The Latvian government carried out a fiscal adjustment of 8.8 percent of GDP in 2009 and 5.9 percent of GDP in 2010, amounting to a fiscal adjustment of 14.7 percent of GDP over the course of two years, totaling 17.5 percent of GDP over four years, according to IMF calculations. Greece did the opposite. According to the IMF, its fiscal adjustment in the initial crisis year of 2010 was a paltry 2.5 percent of GDP, and in 2011 only 4.1 percent, a total of only 6.6 percent of GDP over two years. Greece’s total fiscal adjustment over four years was only 11.1 percent of GDP. In Greece, the rigor of the attempted therapy fell far short of the severity disease, precluding any cure. Needless to say, financial confidence was not restored, and economic decline continued. The key to resolving financial crisis is getting ahead of the curve, pursuing a sufficiently swift fiscal adjustment so that the budget deficit as a share of GDP drops. This is exactly what Latvia did. In its fourth year of fiscal adjustment Latvia had an insignificant budget deficit of 0.8 percent of GDP, according to Eurostat. Because of its inadequate fiscal adjustment, the Greek government never managed to get ahead of the curve and reduce its budget deficit as a share of GDP, especially since the size of its GDP was also declining – a common problem in a severe crisis. Market confidence was never restored. From 2010-13, according to Eurostat, Greece had an average budget deficit of 10.5 percent of GDP, peaking at 12.2 percent of GDP in 2013. (Note that IMF statistics assessing the Greek budget deficit at only 3.8 percent of 2013 GDP failed to include the bank recapitalization costs included in statistics from Eurostat.) By my definition, this was no austerity. Indeed, the front-loaded fiscal adjustment of austerity works best for improving economic growth. It restores all forms of confidence and financial balance, and drives structural reforms, making it possible to pursue vested interests. In 2008-10 Latvia suffered an output decline of 24 percent, as much as Greece did in the six-year span from 2009-14. However, thanks to its front-loaded fiscal adjustment, Latvia was able to restore its public finances after two years. The country has shown solid economic growth, averaging 4.3 percent per year from 2011-14, according to Eurostat. The most striking development is the expansion of exports. Throughout Europe, exports hit a nadir in 2009 and recovered afterward. Eurostat reports that Greek exports increased modestly, growing 45 percent from 2009-13, while Latvia’s exports skyrocketed by 85 percent during the same time period. Latvia’s radical reforms unleashed a supply effect. Export growth is a reflection of structural reforms and other efforts enhancing supply, which Latvia pursued far earlier than Greece. The consequences of tepid Greek fiscal stabilization have been a devastating six years of declining output, even as the Latvian economy has revived. In 2013 Latvia’s GDP at constant prices was 4 percent lower than in 2008, while Greece’s was 23 percent less than in 2008, according to the IMF. A cumulative difference in GDP development of 19 percentage points over six years cannot be a statistical blip – it is real. At the height of the euro crisis, Jean-Claude Juncker, then prime minister of Luxembourg, accidentally summarized everything wrong with political thought on the crisis when he said: “We heads of government all know what to do, we just don’t know how to get reelected when we do it.” This feels self evident, but is in fact patently untrue. Juncker’s words reflected an unfortunate contempt of elites for their voters, suggesting that citizens are short-sighted while political leaders are enduringly wise. The financial crisis in Europe has shown that the opposite is true: governments that pursued short-term and irresponsible fiscal policies in the vain hope of temporary growth improvements have been thrown out, while quite a few fiscally responsible governments have been reelected. During the five years from September 2008 to August 2013, 19 of the 28 EU governments were kicked to the curb, while eight remained in power, namely the governments of Estonia, Finland, Germany, Latvia, the Netherlands, Poland, Sweden, and Luxembourg. These eight countries have center-right governments, which pursued responsible fiscal policies. More often than not, radical front-loading of fiscal adjustment has proven popular with voters, who want to see political leadership. Latvia’s Prime Minister Valdis Dombrovskis was reelected twice, while George Papandreou lost massively. Yet Krugman has continued to argue. “Yes, there are big failings in Greece’s economy, its politics, and no doubt its society. But those failings aren’t what caused the crisis that is tearing Greece apart … No, the origins of this disaster lie further north, in Brussels, Frankfurt, and Berlin, where officials created a deeply – perhaps fatally – flawed monetary system.” Yet the euro has persisted, and all other EU countries have recovered. Greece is instead the victim of its own long-simmering irresponsible fiscal policies. Since Andreas Papandreou became prime minister in 1981, Greece has stood out for its profligacy. According to Eurostat, from 1981-99 Greece had an average budget deficit of no less than 8.7 percent of GDP; Papandreou ruled for eleven of those years. His was a parasitical and oligarchic regime that used socialism to rebuild an old clientelist system (see also “Sisyphus Hasn’t Gotten Even Started Yet” by Richard Fraunberger from our May/June 2015 issue). Multiple Greek governments grossly doctored their statistics, with a real average budget deficit of 6.1 percent of GDP during the years 2000-08. Not one single year did Greece fulfill its EU obligation to maintain the Maastricht ceiling, a budget deficit of less than 3 percent of GDP. It was consistently assessed the most corrupt country in the union. If the EU bears any blame, it is for failing to impose its formal standards earlier. 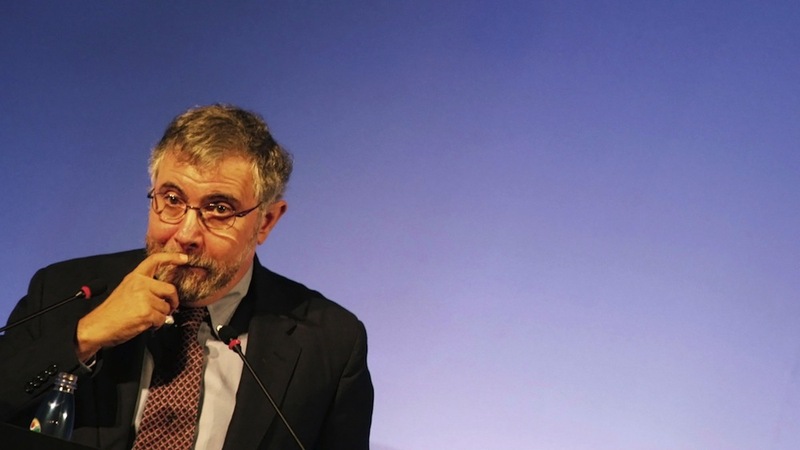 Rather than retreat, Krugman escalates. In a recent op-ed, he compared German policy towards Greece with British and French policy toward Weimar Germany after World War I, claiming that “austerity has devastated [Greece’s] economy as thoroughly as military defeat devastated Germany.” I beg your pardon? How can Germany giving Greece large loans at minimal interest rates be compared with the British and French demand for war reparations? The money is flowing in the opposite direction. Key EU demands of structural reform in Greece should instead combat corruption and oligarchy, eventually leading to growth. Recent discussions have pushed the idea that Europe should follow America’s lead in abandoning austerity. But the US suffered a smaller decline in output in 2009 than the European Union, enjoying a steady growth of about 2 percent ever since. And while a great deal of noise has been made about fiscal stimulus in 2009, the US has in fact pursued austerity itself. Its budget deficit shrank from 9.8 percent of GDP in 2009 to 2.8 percent of GDP last year according to the Congressional Budget Office, showing that rigorous austerity works. In the end, Krugman has been wrong on virtually everything he has said about European fiscal policy. He has advocated large and lasting fiscal deficits, which have landed many countries in fiscal crisis without growth. He has ignored Europe’s low growth problems, which stem from poor business environments, overregulated labor markets, elevated taxes, and distortive public expenditures. He has turned his back on corruption and red tape. Syriza’s victory in Greece shows the danger awaiting the political establishment should it fail to stand up and do the opposite of what Krugman suggests. We need to go back to basics in fiscal policy, as Europe has in fact been doing. If a country has a bigger budget deficit than it can finance, it needs to reduce the deficit and do so fast. In moments of crisis, political resistance is the lowest – and as sharp cuts in public expenditures cannot be distributed evenly, they should be concentrated around the least beneficial public activities. Such cuts are also likely to drive structural reforms contributing to economic growth. At the same time, international financial support is vital to countries in serious financial crisis, and for that we fortunately have the IMF and the EU. In short, the whole Krugman argument to abandon fiscal responsibility can be dismissed – the ends we have observed show his thinking to be empirically wrong, and the means available render his ideas impossible.